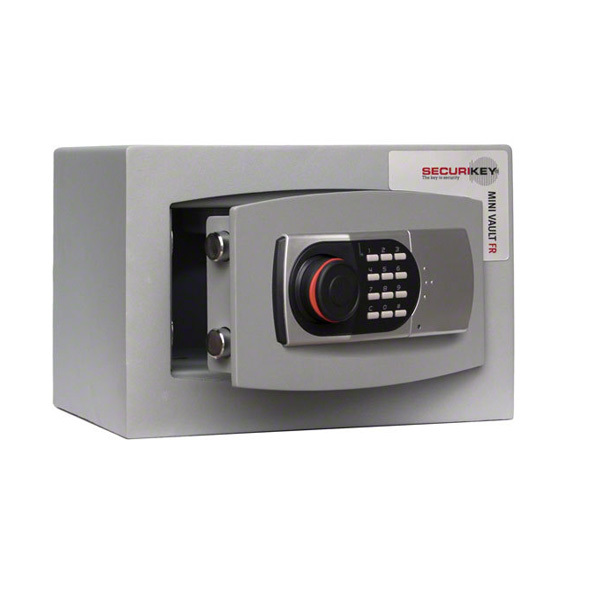 Securikey Mini Vault FR 0E compact fire and security safe. Cash rating €4,000 or valuables rating €40,000. 30 minutes fire resistance in accordance with DIN 4102. Electronic combination lock up to 16 digits powered by 4 x AA batteries (included). Master code in case of lock out. Internal LED lighting when safe door is opened. Double wall steel construction, 4mm outer wall and 2mm inner wall with fire resistant filling. 8mm solid steel door with 25mm locking bolts. Flush fit door with concealed hinges. This product is equipped with a battery powered electronic combination lock. This type of lock only allows entry when a PIN code is entered into the keypad. The PIN code is user changeable and the combinations can range from 4 up to a maximum of 16 digits. This safe is suitable for protecting paper from fire. The safe's internal temperature will remain below 177°C, the approximate combustible temperature of paper for a period of 30 minutes. This safe is suitable for protecting cash and valuables such as jewellery or electrical equipment. This type of safe offers protection against theft and should be gauged by the manufacturer cash rating. The cash rating 4K indicates this model has a €4,000 cash rating or valuables rating (cash rating X 10) of €40,000.